While the wind howls and blows bringing what feels like winter with every breath, Matt gets busy in the kitchen preparing my favorite “comfort” food, lasagna. The wood stove is packed full of logs and finally cranking out some much needed heat to warm cold toes. I pour us both a cold pint of our favorite beer, Flying Monkeys’ Hoptical Illusion, pull up a stool at the island bar, and settle in to watch Matt whip up this cheesy mouth-watering meal. He relaxes into a rhythm which is just plain fun to follow. He slips and slides in sock feet across the hardwood floor methodically washing, chopping, stirring, cooking, and even breaking to take the photos. He always makes it look so easy. Lasagna is one of those meals that instantly brings memories of childhood flooding back to me. 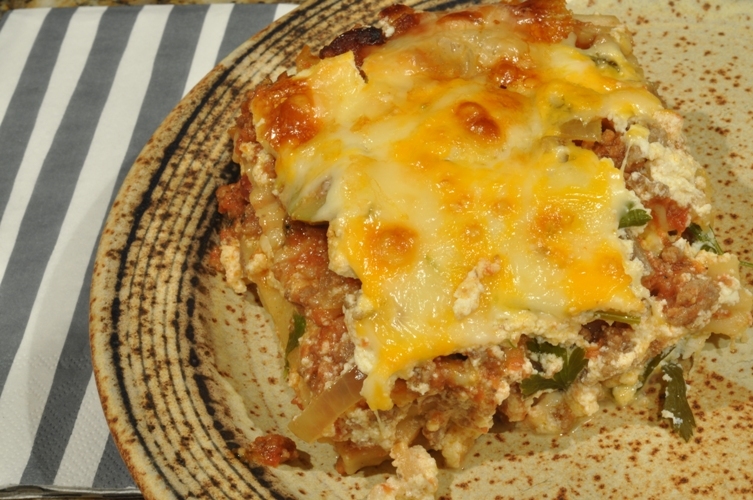 My mom was the queen of the layered, cheesy, runny “homemade” sauce lasagna that would leave you smacking your lips and licking your plate when backs were turned. And, until Matt began making lasagna with our homemade tomato sauce, I never thought I would ever taste one as good as my mamma used to make. But, she’s now met her match, forced to throw in her apron because Matt’s lasagna is just as good…maybe better but don’t tell her that. I swear the secret to great tasting lasagna isn’t all the extras you add to make it your own but the fresh home canned tomato sauce. Okay, I’ll concede better ingredients help too, but without the sauce you’ll never compete with mama. 8-10 stuffed olives; thinly sliced – if you can find the Tassos olives for a reasonable price get them…they’re yummy! In a bowl, mix together ricotta cheese, egg, nutmeg, and fresh parsley. Stir to combine. In a skillet set to medium-high heat add 1 tsp olive oil and ground beef. Cook until the beef is brown. Then add onions, pepperoni and remaining olive oil. Cook until onions are softened about 10 minutes. Mix in garlic and continue to cook for 2-3 minutes. 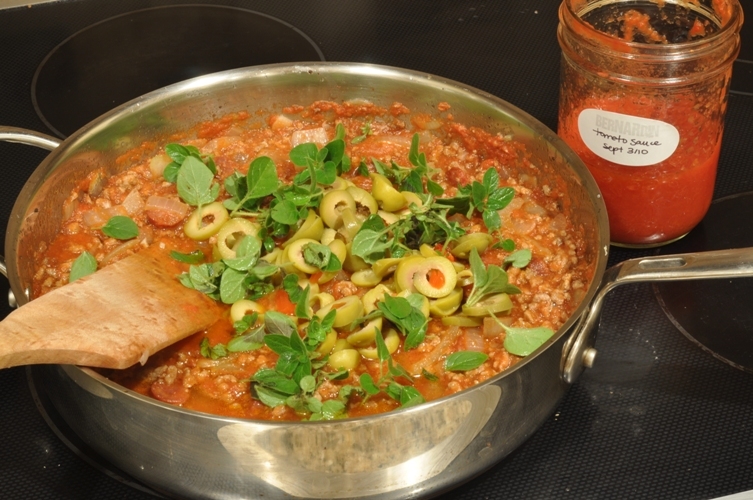 Pour in tomato sauce, stir to combine all ingredients and simmer for 15-20 minutes. Turn off heat, add olives, oregano, and salt and pepper to taste. 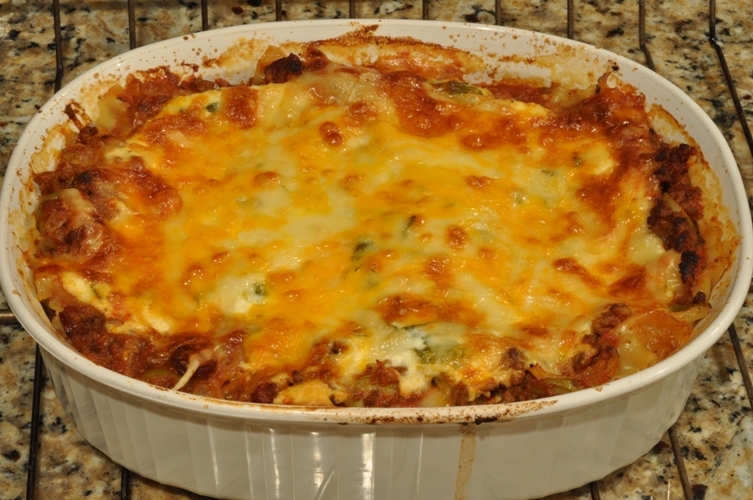 On the bottom of a baking dish (approximately 9″x12″) place a layer of lasagna noodles. 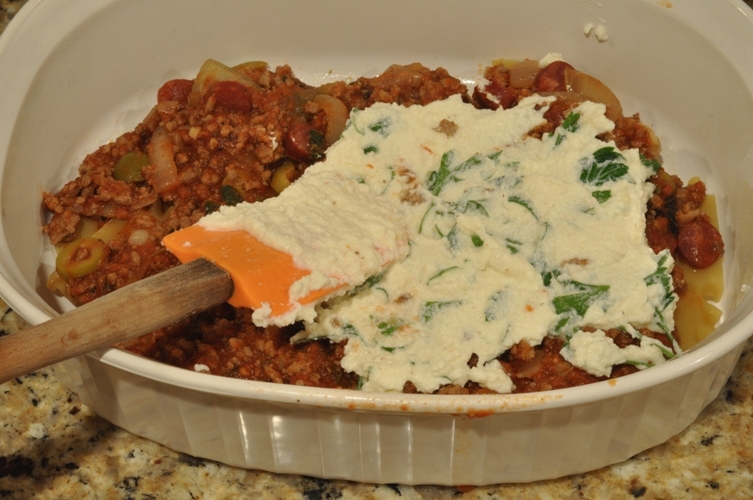 Smooth in thin layers over the noodles, the meat sauce mixture, the ricotta mixture, and the grated cheese. Repeat layers until ingredients are used up. 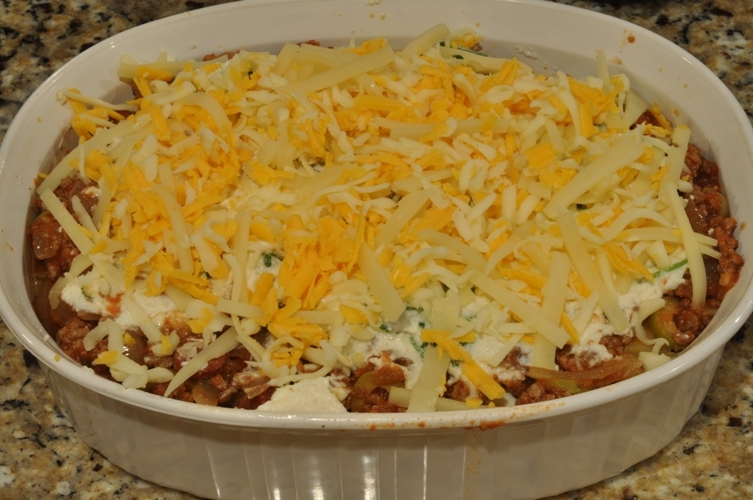 Finish with a layer of grated cheese on top. Cover loosely with aluminum foil and place in preheated oven to bake for 40 minutes. Remove cover and continue to bake for an additional 20 minutes or until the cheese is browning in spots. Matt swears the cooling time is very important in order to let the lasagna set up properly so it can be served in those picture perfect pieces (as seen in photo at the top of the page). But, I could care less about waiting 20 long minutes to sink my teeth into one forkful. I really don’t mind a saucy, liquidy mess on my plate because it reminds me of my mom’s lasagna. Back in the day, there was simply no way she was making four hungry kids wait 20 minutes for their favorite meal. So, a plate of runny cheesy sauce with noodles sounds right up my alley and the sauce part is easily swept up with a few passes of garlic bread. At least that’s what I think. Note: We purchase our stuffed Tassos olives with red peppers and onions from Costco. They usually stock them in the fall and winter months and they are about a third of the price of retail value. I can’t wait to make this one.